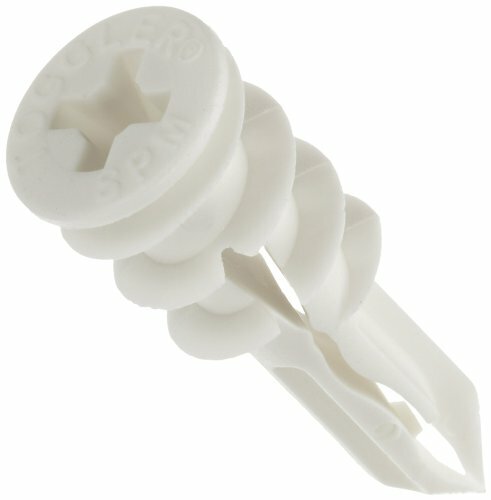 The TOGGLER SnapSkru SPM Mini self-drilling drywall anchor installs into 3/8"- to 5/8"-thick drywall ceilings and walls without requiring a predrilled hole, and is made in USA. Its corrosion-resistant glass-filled nylon body installs into drywall with a Phillips driver, a hand drill, or a screw gun. The anchor's positive stop mechanism prevents the anchor from being driven too far into the drywall. The anchor accepts #6 to #8 size sheet metal screws with a length equal to the thickness of the item being fastened plus 1". Inserting a screw activates the anchor's jaw, locking the anchor into place and compressing the drywall for a vibration- and shock-resistant hold. The jaws emit a noise when activated, providing audible confirmation that the anchor system has been installed successfully. SPM Mini #6 x 1-1/4" 57 lb. 65 lb. 95 lb. SP #8 x 1-1/2" 57 lb. 79 lb. 135 lb. SPM Mini #6 x 1-1/4" 105 lb. 131 lb. 175 lb. SP #8 x 1-1/2" 108 lb. 149 lb. 178 lb.